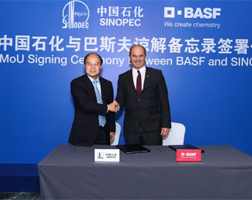 Chemical giant BASF has entered into its second major investment in China this year, having recently signed a memorandum of understanding (MOU) with the country’s oil major Sinopec Corp, to further expand their existing 50:50 joint venture BASF-YPC Company (BASF-YPC) and to build a steam cracker in east China. According to the MOU, BASF-YPC will invest in a 50% stake in the new cracker. Sinopec Yangtzi Petrochemical (YPC) will take the other 50%. The additional steam cracker will have a capacity of 1 million tonnes/year of ethylene, and. A joint pre-feasibility study will be concluded by the end of 2018. Additionally, the two companies will jointly explore new business opportunities in China’s fast-growing battery materials market. “This additional investment into a new steam cracker and the expansion of our BASF-YPC joint venture in Nanjing underline the strong partnership between Sinopec and BASF and the commitment to our customers in China,” BASF Chief Executive Martin Brudermueller said. The partners are also jointly exploring new business opportunities in battery materials. The rising importance of alternative energy in China, especially in the automotive industry, has led to a surge in demand for innovative battery materials for a range of applications, said the companies. BASF-YPC was founded in 2000, with a total investment to date of approximately US$5.2 billion. The integrated petrochemical site produces about 3 million tonnes of high-quality chemicals and polymers for the Chinese market annually. The products serve rapidly-growing demand in multiple industries including agriculture, construction, electronics, pharmaceutical, hygiene, automotive and chemical manufacturing. BASF-YPC posted sales of approximately CNY 21 billion in 2017 and employed 1,882 people as of the end of that year. In July, BASF also undertook a preliminary deal to build China’s first wholly foreign-owned chemicals complex in Guangdong, valued at US$10 billion in investment up until to 2030. The deal was aided in part by trade tensions between Beijing and Washington. 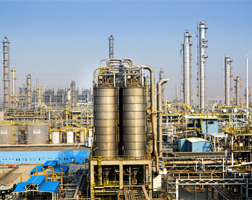 Following on from BASF’s July deal, US energy major ExxonMobil Corp signed a pact to build a petrochemical/LNG complex in Huizhou city of Guangdong, which will also be solely foreign-owned, while Riyadh-headquartered Sabic followed suit and signed a deal with the Fujian government to develop a large-scale petrochemicals complex in Fujian.